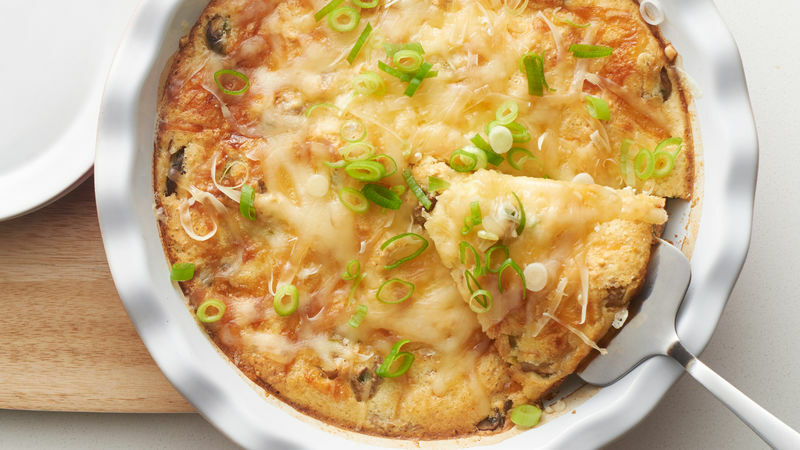 In 10-inch skillet, cook turkey, mushrooms and green onions over medium heat 8 to 10 minutes, stirring occasionally, until turkey is no longer pink. Stir in seasoning, and spoon into pie plate. Sprinkle with 1/2 cup of the cheese. In small bowl, stir Bisquick™ mix, milk and eggs with fork or whisk until blended. Pour into pie plate. Bake 22 to 25 minutes or until knife inserted in center comes out clean. Sprinkle with remaining 1/2 cup cheese; let stand 5 minutes. Sprinkle with more green onions, if desired. Top off a slice of this delicious pie just like you would a cheeseburger. Some favorites are bacon, Dijon mustard or sliced tomato. This Impossibly Easy Pie can be covered and refrigerated up to 24 hours before baking. You may need to bake a bit longer than the recipe directs since you’ll be starting with a cold pie. Watch carefully for doneness.